RASUWA, Nepal, Jul 22 2014 (IPS) - Durga Ghimire had her first child at the age of 18 and the second at 21. As a young mother, Durga didn’t really understand the importance of taking care of her own health during pregnancy. “I didn’t realise it would have an impact on my baby,” she says as she sits on the porch of her house in Laharepauwa, some 120 kilometers from Nepal’s capital, Kathmandu, nursing her third newborn child. It is late in the afternoon and she is waiting expectantly for her two older daughters to return from school. One is nine and the other is six, but they look much smaller than their actual age. “They are smaller in height and build and teachers at school say their learning process is also much slower,” Durga tells IPS. She is worried that the girls are stunted, and is trying to ensure her third child gets proper care. A recent United Nations Children Fund (UNICEF) report shows that Nepal is among 10 countries in the world with the highest stunting prevalence, and one of the top 20 countries with the highest number of stunted children. UNICEF explains stunting as chronic under-nutrition during critical periods of growth and development between the ages of 0-59 months. The consequences of stunting are irreversible and in Nepal the condition affects 41 percent of children under the age of five. “Nepal’s ranking […] is worrying, not just globally but also in South Asia,” Giri Raj Subedi, senior public health officer at Nepal’s ministry of health and population, tells IPS. A 2013 progress report on the Millennium Development Goals (MDGs) done by Nepal’s National Planning Commission (NPC) says while the number of stunted children declined from 57 percent in 2001 to 41 percent in 2011, it is still high above the 30 percent target set by the U.N..
“Stunting is a specific measure of the height of a child compared to the age of the child, and it is indicative of how well the child is developing cognitively,” says Peter Oyloe, chief of party of USAID Nepal’s Suaahara, or ‘Good Nutrition’ project at Save the Children Nepal. Child health and nutrition experts argue that, while poverty is directly related to inadequate intake of food, it is not the sole indicator of malnutrition or increased stunting. Saba Mebrahtu, chief of the nutrition section at UNICEF-Nepal, says the immediate causes include poor nutrient intake, particularly early in life. Fifty percent of stunting happens during pregnancy and the rest after infants are born. “When we are talking about nutrient-rich food […] we are talking about ensuring that children get enough of it even before they are born,” says Mebrahtu. The time between conception and a child’s second birthday is a crucial period, she said, one of rapid growth and cognitive development. Thus it is incumbent on expecting mothers to follow a careful diet before the baby is born. Sadhana Ghimire, 23, lives a few doors down from Durga. Separated by a few houses, their approaches to nutrition are worlds apart. Ghimire breast-fed her 18-month-old daughter exclusively for six months. She continues to make sure that her own diet includes green leafy vegetables, meat or eggs, along with rice and other staples, as she is still nursing. She gives credit to the female community health-worker in her village, who informed her about the importance of the first 1,000 days of a child’s life. In preparation for her daughter’s feeding time, Ghimire mixes together a bowl of homemade leeto, a porridge containing one-part whole grains such as millet or wheat and two-parts pulses such as beans or soy. “I was only using grains to make the leeto before I was taught to make it properly by the health workers and Suaahara,” she says. However, making leeto was not the most important lesson Ghimire learned as an expecting mother. “I had no idea that simple things like washing my hands properly could have such a long term effect on my daughter’s health,” she says. Even seemingly common infections like diarrhoea can, in the first two years, put a child at greater risk of stunting. “That is because the nutrients children are using for development are used instead to fight against infection,” says Mebrahtu emphasising the need for simple practices such as proper hand washing and cleaning of utensils. 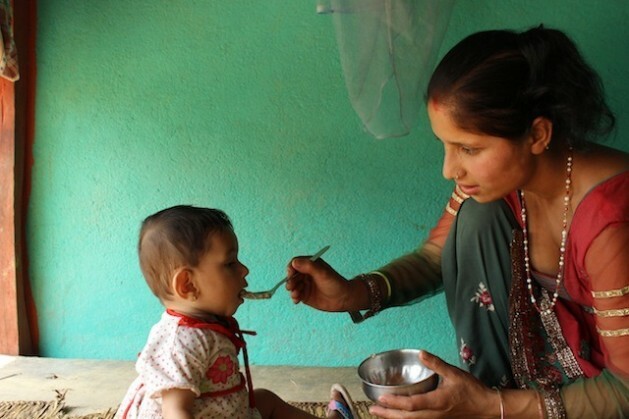 Food insecurity is one of the biggest contributing factors to stunting in Nepal. Rugged hills and mountains comprise 77 percent of the country’s total land area, where 52 percent of Nepal’s 27 million people live. Food insecurity is worst in the central and far western regions of the country; the prevalance of stunting in these areas is also extreme, with rates above 60 percent in some locations. Thus experts recognise the need to fight simultaneously on multiple fronts. “Our work in nutrition has proven again and again that a single approach to stunting doesn’t work because the causes are so many – it really has to be tackled in a coordinated way,” says UNICEF’s Mebrahtu. In 2009 the government conducted the Nutrition Assessment and Gap Analysis (NAGA), which recommended building a multi-sector nutrition architecture to address the gaps in health and nutrition programmes. “The NAGA study stated clearly that nutrition was not the responsibility of one department, as was previously thought,” Radha Krishna Pradhan, programme director of health and nutrition at Nepal’s NPC, tells IPS. Nepal is also one of the first countries to commit to the global Scaling Up Nutrition (SUN) movement, which recognises multiple causes of malnutrition and recommends that partners work across sectors to achieve nutritional goals. Thus, in 2012, five ministries in Nepal came together with the NPC and development partners to form the Multi-Sector Nutrition Plan (MSNP). Public health experts say MSNP is a living example of the SUN movement in action and offers interventions with the aim of reducing the current prevalence of malnutrition by one-third. Interventions include biannual vitamin D and folic acid supplements for expectant mothers, deworming for children, prenatal care, and life skills for adolescent girls. On the agricultural front, ministries aim to increase the availability of food at the community level through homestead food production, access to clean and cheap energy sources such a biogas and improved cooking stoves, and the education of men to share household loads. MSNP’s long-term vision is to work towards significantly reducing malnutrition so it is no longer an impending factor towards development. The World Bank has estimated that malnutrition can cause productivity losses of as much as 10 percent of lifetime earnings among the affected, and cause a reduction of up to three percent of a country’s GDP. At present the Plan is in its initial phase and has been implemented in six out of 75 districts in Nepal since 2013.